Enjoy ultimate protection while saving money year-round. 1½” thick insulation* for maximum thermal performance. Interlocking panel for a crisp, clean finish. Vinyl surface to repel elements and allow respiration. 16’8″ panel length resembles natural wood with no face nailing or caulking. Lower Your Monthly Energy Bill. 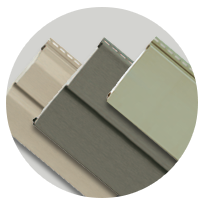 Clad your home with the Prodigy® profile of your choice. Whether it’s Single 7, D6 Clapboard or D5 Dutch Lap, you can be sure you’re receiving an energy-efficient product designed to save you precious dollars month to month. Not sure which profile you need? Our in-home specialists will help you decide on a profile during your free estimate. Prodigy® siding is one of the most advanced technologies on the market. With the thickest EPS foam we offer, this siding product will protect your exterior, stabilize your interior climate and reduce energy costs each month. 1-½” of insulation make this science ideal if you’d like the most energy-efficient home possible. Think Prodigy® Siding could be right for your Baton Rouge home? Contact us today for your free home estimate!